The calcineurin B-like protein (CBL) and CBL-interacting protein kinase (CIPK) signaling system plays a key regulatory role in plant stress signaling. The roles of plant-specific CIPKs, essential for CBL-CIPK functions, in the response to various abiotic stresses have been extensively studied so far. However, until now, the possible roles of the CIPKs in the plant response to heavy metal toxicities are largely unknown. In this study, we used bioinformatic and molecular strategies to isolate 12 HsCIPK genes in Tibetan Plateau annual wild barley (Hordeum spontaneum C. Koch) and subsequently identified their functional roles in the response to heavy metal toxicities. 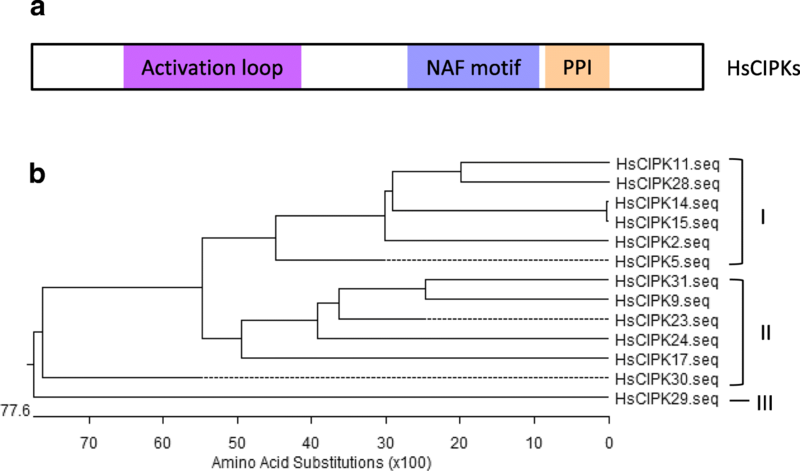 The results showed that multiple HsCIPKs were transcriptionally regulated by heavy metal toxicities (e.g., Hg, Cd, Cr, Pb, and Cu) and other abiotic stresses (e.g., salt, drought, aluminum, low and high temperature, and abscisic acid). Furthermore, the ectopic overexpression of each HsCIPK in rice (Oryza sativa L. cv Nipponbare) showed that transgenic plants of multiple HsCIPKs displayed enhanced tolerance of root growth to heavy metal toxicities (Hg, Cd, Cr, and Cu), salt and drought stresses. These results suggest that HsCIPKs are involved in the response to heavy metal toxicities and other abiotic stresses. Tibetan Plateau annual wild barley HsCIPKs possess broad applications in genetically engineering of rice with tolerance to heavy metal toxicities and other abiotic stresses. In plant cells, the calcium ion (Ca2+) is involved as a second messenger in the regulation of a variety of abiotic and biotic stress responses and the formation and development of plant organs (Dodd et al. 2010). The core components of Ca2+ signaling are calcium sensors, including calmodulins (CaMs), calmodulin-like proteins (CMLs), calcium-dependent protein kinases (CDPKs), and calcineurin B-like proteins (CBLs), which bind Ca2+ and activate downstream signaling components (Rudd and Franklin-Tong 1999; Singh and Parniske 2012; Zheng et al. 2013). Among these Ca2+-bound calcium sensors, CBLs selectively interact with plant-specific CBL-interacting protein kinases (CIPKs) and thereby form a CBL-CIPK signaling system that has been demonstrated to serve as a key regulation node during stress signaling in plants (Luan 2009; Weinl and Kudla 2009; Shen et al. 2014). Thus, dissecting the mechanisms of the CBL-CIPK signaling system is one of the research priorities in the plant stress physiology field. Due to the lack of kinase activity in CBLs, different combinations with CIPKs largely determine the specificity, diversity, and complexity of the CBL-CIPK signaling system (Batistic et al. 2010). Therefore, functional identification of the CIPKs in distinct plant species will enhance the better understanding of the functional roles and modes of action of the CBL-CIPK signaling system. Bioinformatic analysis has shown that there are 26 and 31 CIPK homologous genes in the model plant genomes of Arabidopsis thaliana and rice (Oryza sativa), respectively (Kolukisaoglu et al. 2004). Recently, multiple CIPK families have been bioinformatically identified in other plant species, including poplar (Populus) (Yu et al. 2007), cotton (Gossypium spp) (Wang et al. 2016a), soybean (Glycine max) (Zhu et al. 2016), canola (Brassica napus) (Zhang et al. 2014), eggplant (Solanum melongena) (Li et al. 2016), cassava (Manihot esculenta) (Hu et al. 2015), maize (Zea mays) (Chen et al. 2011), and wheat (Triticum aestivum) (Sun et al. 2015). However, genomic analysis of the cultivated barley (Hordeum vulgare) HvCIPK family remains lacking. Tibetan plateau wild barley, in particular, the annual wild barley (Hordeum spontaneum C. Koch), has suffered the extreme climate and environmental conditions for a long term and therefore has evolutionally generated abundant natural variations and/or unique gene networks for stress tolerance. Due to the close genetic homology of Tibetan plateau wild barley to cultivated barley, the Tibetan plateau was recently considered to be one of the centers of domestication of cultivated barley (Dai et al. 2012). Thus, Tibetan plateau wild barley is one of the few germplasm resources to utilize wild barley CIPKs to genetically engineer rice or other crops with higher stress tolerance. Although CIPKs have been demonstrated to function in various responses to abiotic stresses, including salt, drought, flood, wounding, abscisic acid (ABA), low and high temperature (Guo et al. 2001; Kim et al. 2003; Lee et al. 2009; Li et al. 2012; Yan et al. 2014; Zhang et al. 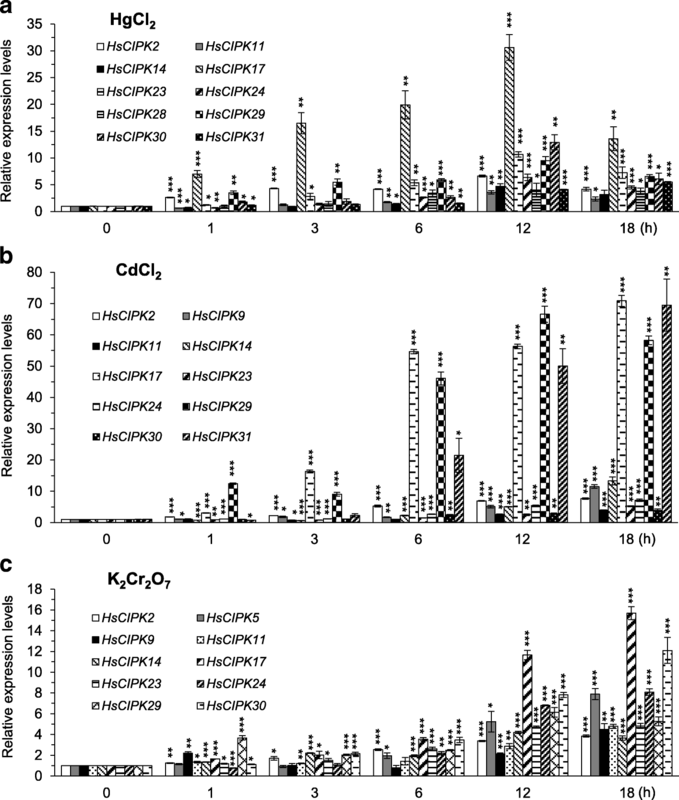 2014), biotic stresses, such as pathogen infection (Kurusu et al. 2010; de la Torre et al. 2013; Meteignier et al. 2017), and nutrient deficiency (Xu et al. 2006; Pandey et al. 2007; Wang et al. 2016b; Straub et al. 2017), so far, no evidence has shown that CIPKs are involved in the plant response to heavy metal toxicities, which is one of the most dangerous types of toxic species for plants and therefore for animals and humans via the food chain. Heavy metals are defined as elements having a specific gravity above five and include mercury (Hg), cadmium (Cd), chromium (Cr), copper (Cu), and lead (Pb). Heavy metals-polluted soils cause irreversible harm to plant growth and development, and crop yield and quality (Mustafa and Komatsu 2016) due to their extremely stable and nonbiodegradable biochemical characteristics. Heavy metal ions enter the cell and tightly bind to intracellular protein enzymes by replacing specific cations from their binding sites, leading to the inactivation of enzymes and the induction of reactive oxygen species (ROS), (Sharma and Dietz 2009), which causes oxidative damage to plant cells. Recent studies have shown that Ca2+ or Ca2+-dependent signaling is involved in plant tolerance to heavy metal stresses, including Cd and Cr (Fang et al. 2014; Huang et al. 2014; Ahmad et al. 2015), and aluminum (Al) toxicity (Zhang and Rengel 1999; Lan et al. 2016). However, whether CIPKs function in Ca2+-dependent plant tolerance to heavy metal and Al toxicities is largely unknown. In this study, we functionally identified the roles of 12 members of the Tibetan plateau annual wild barley HsCIPK family in the response to heavy metal toxicities, including Hg, Cd, Cr, Cu, and Pb, and other abiotic stresses such as salt, drought, Al, low and high temperature, and ABA. Our results demonstrate that multiple HsCIPKs are involved in plant tolerance to multiple heavy metal toxicities and salt and drought stresses. Grains of wild barley, Tibetan Plateau annual wild barley X74 (Hordeum spontaneum C. Koch), and Nipponbare rice (Oryza sativa L. ssp. japonica) were surface sterilized by 70% ethanol for 10 min followed by 10% NaClO for 30 min and finally 8 rinses with water. The endosperms in barley and rice grains contain a large amount of nutrients and therefore provide enough nutrients to sustain the grains for one week following germination. Thus, a simple CaCl2 solution (0.1 mM CaCl2; pH 5.8; Pan et al. 2004) was used for barley and rice grain germination and seedling growth. To germinate the barley grains (Pan et al. 2004), sterilized grains were germinated between two layers of wet filter papers with the CaCl2 solution for one day under darkness (25 °C), and the germinated grains were incubated for another four days in the CaCl2 solution under darkness (25 °C). To germinate the rice grain (Pan et al. 2011), sterilized grains were treated for three days under darkness (4 °C) and subsequently incubated for 3 days at 37 °C for germination. Finally, the germinated rice grains were transferred to the CaCl2 solution and incubated for four days under light conditions (14-h light/10-h dark, 28 °C light/25 °C dark). Four-day-old barley and rice seedlings with similar root lengths were used in this study. Two approaches were used in HsCIPK in silico cloning. We first used available full-length cDNAs of rice OsCIPK1 to OsCIPK31 (http://www.ncbi.nlm.nih.gov/) (accession numbers of the OsCIPK cDNAs are shown in Additional file 1: Table S1) as probes to search for their homologous genes in a full-length cDNA library of a barley cultivar (http://earth.lab.nig.ac.jp/~dclust/cgi-bin/barley_pub/). Second, full-length cDNAs, conserved motif in kinase domain, and the NAF/FISL domain motif of rice OsCIPK1 to OsCIPK31 as probes were subjected to a BLAST comparison with the barley nucleotide collection (nr/nt) database (http://blast.ncbi.nlm.nih.gov/) for their homologous fragment sequences, and the subsequent resulting homologous fragment sequences were spliced in silico and extended for multiple rounds via corresponding overlapping contigs. Finally, the resulting full-length cDNAs were analyzed by DNA STAR SeqMan and Megalign software. Reverse transcription-polymerase chain reaction- (RT-PCR-) and sequencing-based approaches were used to clone the HsCIPK coding sequences (CDSs) from a total cDNA pool of the Tibetan Plateau annual wild barley X74. HsCIPK-specific primers for the RT-PCR assay (Additional file 1: Table S2) were designed based on the recovered in silico cDNA sequences of the HvCIPKs. Furthermore, 5’-RACE (rapid amplification of cDNA ends) and 3’-RACE were used to confirm individual 5′- and 3′-end sequences. Finally, the resulting full-length cDNAs of individual HsCIPKs were analyzed by sequence alignment and open reading frame (ORF) comparison with OsCIPKs and AtCIPKs (Accession numbers of AtCIPK cDNAs shown in Additional file 1: Table S1). Using the Clustal W Method in DNA STAR Megalign software, cDNA sequence-based predicted amino acid sequences were used to generate a phylogenetic tree of HsCIPKs, OsCIPKs, and AtCIPKs. Unless specified, all reagents were from Sigma-Aldrich. All chemical stock solutions were prepared as follows: water was used to dissolve CaCl2 (1 M), NaCl (5 M), AlCl3 (40 mM), HgCl2 (0.5 M), CdCl2 (10 mM), PbCl2 (10 mM), K2Cr2O7 (0.5 M), and CuSO4 (1 M). Abscisic acid (ABA; 10 mM) was first dissolved in a few drops of 1 M KOH and then diluted with water, whereas polyethylene glycol 6000 (PEG 6000) powders were directly prepared before use (see below). Unless otherwise indicated, in the qRT-PCR analysis of the transcriptionally induced expression levels of the endogenous HsCIPKs under heavy metal toxicities and other abiotic stresses, the final working concentrations were 400 mM for NaCl, 1 mM for CuSO4, 0.5 mM for K2Cr2O7, 20 μM for HgCl2, PbCl2, CdCl2 AlCl3, and ABA, and 20% (w/v) for PEG 6000. In the root growth assay of rice transgenic lines, based on the effects of different concentrations on root elongation in the wild-type Nipponbare rice (Additional file 1: Figure S1), the final working concentrations were 50 mM for NaCl, 50 μM for AlCl3, 5 μM for K2Cr2O7, PbCl2, and CdCl2, 1 μM for ABA, 0.5 μM for HgCl2, 0.25 μM for CuSO4, and 10% (w/v) for PEG 6000. All stock solutions of these chemicals were diluted to the working solutions in a simple CaCl2 solution (0.1 mM CaCl2; pH 5.8), whereas PEG 6000 powders were directly dissolved in a simple CaCl2 solution (0.1 mM CaCl2; pH 5.8) to 10% and 20% (w/v; working concentration) before use. In addition, the time lengths of all the treatments, including temperature (4 °C and 35 °C), are indicated in the text. To examine the effects of heavy metal toxicities and other abiotic stresses on the transcriptional expression levels of endogenous HsCIPKs in Tibetan Plateau annual wild barley, whole seedlings or roots after treatment were used to isolate the total RNAs using an RNeasy Plant Mini Kit (Qiagen). The first-strand synthesis of cDNA was synthesized with a SuperScript III First-Strand Synthesis System (Invitrogen). The qRT-PCR assay was performed with Thunderbird SYBR qPCR mix (Toyobo) and a StepOnePlus Real-Time PCR System (Applied Biosystems). The reactions were performed in a 20-μL volume containing 10 μL 2 × SYBR qPCR mix (Toyobo), 10 ng cDNA, and 1 μM of each gene-specific primer (Additional file 1: Table S3). The PCR cycles were performed as follows: one cycle of 95 °C for 3 min, 40 cycles of 95 °C for 5 s and 60 °C for 50 s. The resulting data were collected and analyzed using the StepOne Software v2.1. The transcriptional levels were normalized to the housekeeping gene HvActin (Additional file 1: Table S3). For each HsCIPK, the transcription levels upon stress treatment for different time lengths were presented as relative values of the 0-h time point (mock control; set as 1.0). For statistical analysis (Student’s t-test, two tails; type 2), the transcription levels from three independent experiments at different time-points were compared with those of the mock control. 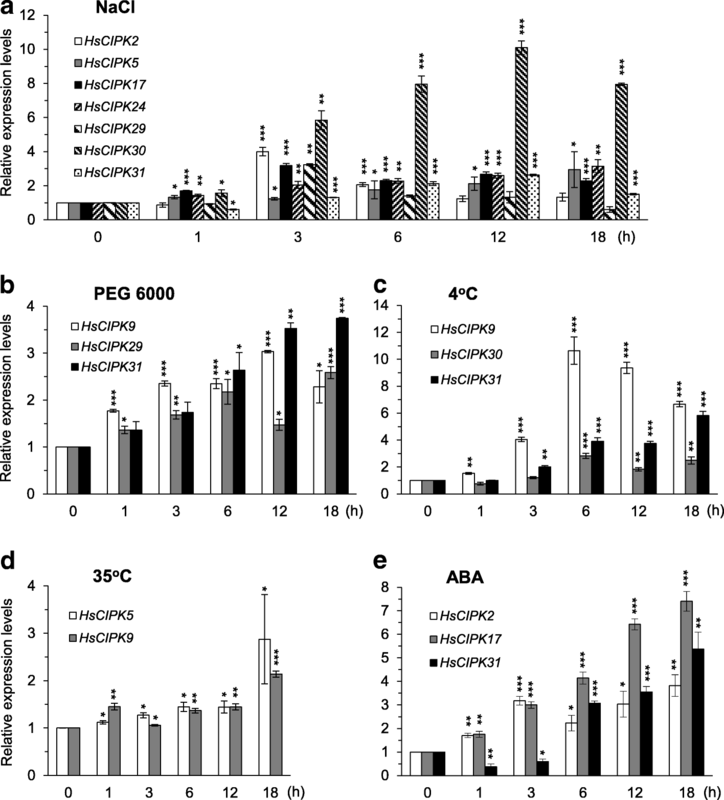 To overexpress each HsCIPK gene in rice, constructs of 35S::HsCIPKs were generated individually using PCR, restriction digestion, and ligation with the plant transformation vector pCAMBIA2300S containing a 2× CAMV 35S promoter and a kanamycin-resistant marker (Xiong and Yang 2003). Finally, the resulting constructs were confirmed by sequencing. All the primer sequences for the HsCIPK constructs are indicated in Additional file 1: Table S2. For rice transformation, Nipponbare rice mature embryos were used as the initial materials for callus induction. Briefly, surface-sterilized mature embryos were incubated on agar plates containing N6D media (Ozawa 2009; Toki et al. 2006) for callus induction. Light yellow, compact and hard calluses were used in the Agrobacterium-mediated transformation with Agrobacterium tumefaciens EHA105 (Hiei and Komari 2008). Kanamycin-resistant vigorous calluses were recovered on selection solid media containing G418 (150 mg/L; Amresco) due to high-level kanamycin-resistance in the wild-type rice background (Dekeyser et al. 1989) and subsequently transferred to differentiation solid media with G418 (100 mg/L) for green shoot induction. Finally, the roots were induced on solid rooting media with G418 (70 mg/L). After acclimatization, regeneration plantlets (T1 generation) were cultivated in hydroponic conditions. To determine whether these transgenic plants harboring 35S::HsCIPK constructs are true overexpression lines, a RT-PCR assay was performed in T1 generation plants. RNA isolation and cDNA synthesis were conducted as described. RT-PCR primers were designed in the OsCIPK nonhomologous region of HsCIPKs (Additional file 1: Table S4). Rice OsActin2, a housekeeping gene, was used as an internal control (Additional file 1: Table S4), whereas the wild-type Nipponbare cDNA sample served as a negative control (NC). Twenty-seven cycles of PCR were used to amplify all the exogenous HsCIPKs and the endogenous OsActin2 in the rice transgenic lines. Homozygous lines for all the transgenic lines overexpressing each HsCIPK were recovered in the T3 generation via G418-resistent selection. To determine the roles of the HsCIPKs in the plant response to heavy metal toxicities and other abiotic stresses, primary root growth was used to examine the effect of HsCIPK overexpression on the plant growth response to stress treatments. To quantify root elongation, the primary root lengths were individually measured before (0 h) and after 24 h of treatment. To reduce differential physiological effects on root growth before treatment (0 h), root relative elongation rates (RERs; %) were used to evaluate the stress effects on root growth. The RERs were estimated according to the following formula as previously described (Pan et al. 2004; Pan et al. 2011): RER = (RLT24h-RLT0h)/(RLM24h-RLM0h) × 100%. RLT0h and RLT24h indicate root lengths (RL; mm) before (0 h) and after the 24-h stress treatment, respectively, whereas RLM0h and RLM24h represent the root lengths before (0 h) and after 24 h of mock treatment, respectively. The quantitative data of 45 seedlings for each treatment from three independent experiments were statistically evaluated using a Student’s t-test (two tails; type 2) compared with the nontransgenic regeneration lines (NT; as the wild-type control). Multiple transgenic lines for each construct were examined in the stress treatment and the representative lines are presented. To obtain the HvCIPK cDNA sequences of cultivated barley, we performed an in silico assay to search for the corresponding homologous CIPKs in a full-length cDNA library of cultivated barley using the full-length cDNAs of rice OsCIPK1 to OsCIPK31 (Kolukisaoglu et al. 2004) as probes and subsequently recovered five rice homologous sequences of HvCIPKs, including CIPK2, − 9, − 11, − 23, and − 28. Next, we used conserved motifs in the kinase and NAF/FISL domains of the OsCIPKs combined with full-length cDNAs of OsCIPK1 to OsCIPK31 to BLAST homologous sequences in a nonredundant nucleotide database of cultivated barley and finally obtained eight rice homologous sequences of HvCIPKs, including CIPK5, − 14, − 15, − 17, − 24, − 29, − 30, and − 31. Thus, we obtained 13 potential HvCIPK cDNA sequences. To clone the HsCIPK CDS from the Tibetan Plateau annual wild barley, we used these 13 HvCIPK CDS sequences, combined with RT-PCR- and sequencing-based approaches, to isolate their homologous sequences from a total cDNA pool of Tibetan Plateau annual wild barley. We finally recovered 13 corresponding full-length CDS sequences of HsCIPKs. Previous findings indicated that plant-specific CIPKs possess typical conserved domains, including a kinase domain (activation loop) at the N terminal, a CBL-interacting domain (NAF/FISL motif), and a protein–phosphatase interaction (PPI) domain at the C terminal (Ohta et al. 2003). Analysis of the functional domain prediction confirmed that all of the 13 HsCIPKs indeed contain a conserved activation loop, an NAF/FISL motif, and a PPI domain (Fig. 1a) similar to the rice and Arabidopsis CIPKs (Additional file 1: Figure S2; HsCIPK5 as an example). Phylogenetic analysis of the deduced amino acid sequences showed that these 13 HsCIPKs were evolutionally divided into three branches, including (I) HsCIPK2, − 5, − 11, − 14, − 15, − 28, and − 30, (II) HsCIPK9, − 17, − 23, − 24, and − 31, and (III) HsCIPK29 (Fig. 1b). It is noteworthy that HsCIPK14 has an almost identical sequence to HsCIPK15 except for an additional four amino acids at its 3′-end, similar to the rice and Arabidopsis CIPK14/CIPK15 (Kolukisaoglu et al. 2004), and therefore, only the HsCIPK14 gene was used in the following studies. In addition, except for HsCIPK15, 12 other HsCIPKs CDS and their deduced amino acid sequences have been deposited into the GenBank (Additional file 1: Figure S3a). Next, we analyzed amino acid sequence homologies between the HsCIPKs versus the OsCIPKs and AtCIPKs. The results showed that the HsCIPKs share higher homology with the OsCIPKs (~ 70% to ~ 95%) than the AtCIPKs (~ 46% to ~ 77%) at the amino acid level (Additional file 1: Figure S3b and c). Consistently, phylogenetic tree analysis among the HsCIPKs, OsCIPKs, and AtCIPKs showed that the individual HsCIPKs and corresponding homologous OsCIPKs were located at the identical branches, whereas the AtCIPKs were distributed at the side branches (Additional file 1: Figure S4). These results suggest that the HsCIPKs have a closer genetic relationship to the OsCIPKs than to the AtCIPKs. Thus, we designated the HsCIPK numbers with the corresponding homologous OsCIPK number. It is well known that plant CIPKs function in the regulation of various abiotic and biotic responses (Guo et al. 2001; de la Torre et al. 2013). However, whether CIPKs are involved in the plant response to heavy metal toxicities is largely unknown. To this end, we performed a time-course qRT-PCR analysis to examine whether heavy metal toxicities influence the transcriptional expression levels of the endogenous HsCIPKs in the Tibetan Plateau annual wild barley seedlings treated with HgCl2 (20 μM), CdCl2 (20 μM), K2Cr2O7 (0.5 mM), PbCl2 (20 μM), and CuSO4 (1 mM), respectively. As shown in Fig. 2a, upon seedling exposure to HgCl2 treatment, the transcriptional levels of 10 genes (HsCIPK2, 11, 14, 17, 23, 24, 28, 29, 30, and 31) were dramatically elevated relative to the mock control (0 h time point). Consistently, the expression levels of 10 genes (HsCIPK2, 9, 11, 14, 17, 23, 24, 29, 30, and 31) in the CdCl2 treatment (Fig. 2b), 10 genes (HsCIPK2, 5, 9, 11, 14, 17, 23, 24, 29, and 30) in the K2Cr2O7 treatment (Fig. 2c), five genes (HsCIPK9, 14, 17, 24, and 29) in the PbCl2 treatment (Fig. 3a), and eight genes (HsCIPK2, 5, 11, 17, 23, 29, 30, and 31) in the CuSO4 treatment (Fig. 3b) were significantly increased compared to those in the corresponding mock control (0 h time point). In addition, the maximum induction levels of all 12 endogenous HsCIPKs during each heavy metal treatment are briefly summarized in Additional file 1: Table S5, whereas these HsCIPKs that were transcriptionally three times higher than the mock control are presented in Figs. 2 and 3. These results suggest that the HsCIPKs respond transcriptionally to heavy metal toxicities. 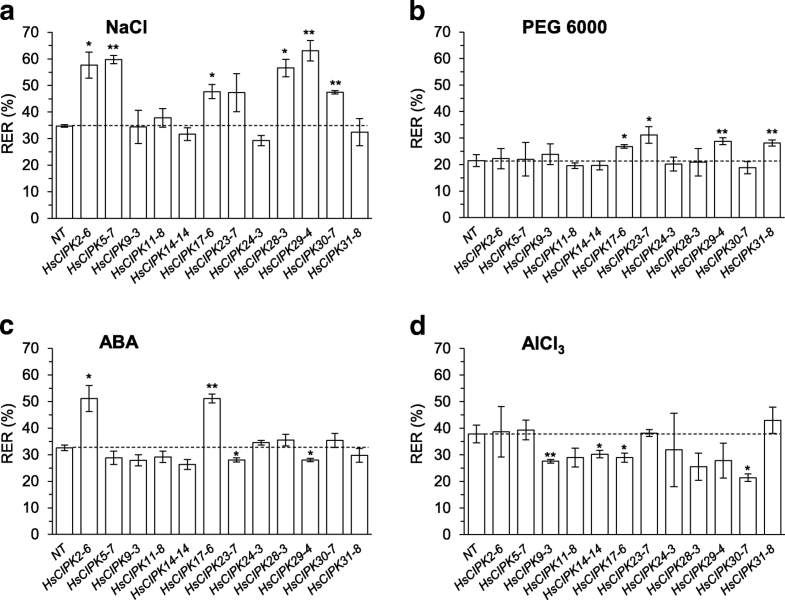 In additional to heavy metal toxicities, we also examined the effects of other abiotic stresses on the transcriptional expression levels of these 12 HsCIPKs in the Tibetan Plateau annual wild barley seedlings, including treatments with NaCl (400 mM), polyethylene glycol 6000 (PEG 6000; 20%; artificial drought), AlCl3 (20 μM), low and high temperature (4 °C and 35 °C), and ABA (20 μM), respectively. Time-course analysis showed that the transcriptional levels of seven genes (HsCIPK2, 5, 17, 24, 29, 30, and 31) in the NaCl treatment (Fig. 4a), three genes (HsCIPK9, 29, and 31) in the PEG6000 treatment (Fig. 4b), five genes (HsCIPK24, 28, 29, 30, and 31) in the AlCl3 treatment (Fig.3c), three genes (HsCIPK9, 30 and 31) in the 4 °C treatment (Fig. 4c), two genes (HsCIPK5 and 9) in the 35 °C treatment (Fig. 4d), and three genes (HsCIPK2, 17, and 31) in the ABA treatment (Fig. 4e) were significantly elevated relative to the corresponding mock control (0 h time point). Furthermore, the maximum expression levels of all 12 endogenous HsCIPKs during salt, PEG, AlCl3, temperature (4 °C and 35 °C), and ABA treatments are briefly summarized in Additional file 1: Table S6, whereas their induction levels, which were two times higher than the mock control are presented in Figs. 3c and 4. These results further confirmed the involvement of HsCIPKs in multiple abiotic stress responses. To provide further evidence for the roles of HsCIPKs in the plant response to heavy metal toxicities and other abiotic stresses, rice transgenic lines overexpressing individual HsCIPKs under the control of the CAMV 35S promoter were generated in the wild-type rice cultivar Nipponbare (Oryza sativa L. ssp. japonica) (Fig. 5a-c), which is a good transformation system and additionally possesses a closer genetic relationship to the wild barley than Arabidopsis at the CIPK levels (Additional file 1: Figsure S3 and S4). A RT-PCR assay with HsCIPK-specific PCR primers was used to examine the overexpression levels of the exogenous HsCIPK genes in the T1 generation plants. As shown in Additional file 1: Figure S5, multiple overexpression transgenic lines for each HsCIPK construct were recovered. In the T3 generation, homozygous transgenic lines with no further segregation were recovered via G418-resistant selection. In plants, heavy metal toxicity-induced symptoms include the inhibition of seed germination and root elongation, wilting and stunted plant growth, chlorosis, leaf rolling and necrosis, and senescence, as well as low biomass (DalCorso et al. 2013), among which root elongation inhibition is an early symptom of heavy metal-induced responses. Thus, root elongation has been widely used as a sensitive indicator for plant responses to heavy metal toxicities (Wong and Bradshaw 1982) and other abiotic stresses (Llugany et al. 1995; Ishikawa et al. 1998). In this study, the relative elongation rate (RER; %) of the primary root was used to evaluate the root growth response to heavy metal toxicities. Heavy metal treatment experiments with different concentrations in four-day-old wild-type Nipponbare seedlings revealed that 0.5 μM HgCl2, 5 μM CdCl2, 5 μM K2Cr2O7, 0.25 μM CuSO4, and 5 μM PbCl2 were suitable to examine the effects of HsCIPK overexpression on root growth response to heavy metal toxicities (Additional file 1: Figure S1). Upon transgenic seedling exposure to HgCl2 treatment for 24 h, the overexpression of HsCIPK2, HsCIPK14, and HsCIPK17 significantly enhanced root growth relative to the corresponding wild-type controls (nontransgenic regeneration lines; NT) (Fig. 5d). Similarly, transgenic lines individually overexpressing seven HsCIPKs (HsCIPK9, 11, 14, 17, 23, 24, and 29) in the CdCl2 treatment (Fig. 5e), five HsCIPKs (HsCIPK2, 5, 9, 17, and 30) in the K2Cr2O7 treatment (Fig. 5f), and four HsCIPKs (HsCIPK5, 24, 29, and 31) in the CuSO4 treatment (Fig. 5g) displayed a significant elevation in root growth relative to the corresponding NT. In the PbCl2 treatment, surprisingly, no transgenic lines displayed enhanced effects in root growth relative to the NT (Fig. 5h). In contrast, the transgenic lines overexpressing HsCIPK31 in the K2Cr2O7 treatment (Fig. 5f) and HsCIPK17, 28, 29, and 30 in the PbCl2 treatment (Fig. 5h), respectively, exhibited a significant reduction in root growth compared to the corresponding NT. The responses of root growth to these heavy metal toxicities in the transgenic lines of all 12 HsCIPKs are summarized in Additional file 1: Table S7. Taken together, these results suggest that multiple HsCIPKs are involved in the plant response to heavy metal toxicities. Next, to test whether the overexpression of HsCIPKs enhances plant tolerance to other abiotic stresses, we examined root growth of four-day-old transgenic rice seedlings treated for 24 h with salt (50 mM NaCl), drought (10% PEG6000), ABA (1 μM), and AlCl3 (50 μM) (Additional file 1: Figure S1), respectively. As shown in Fig. 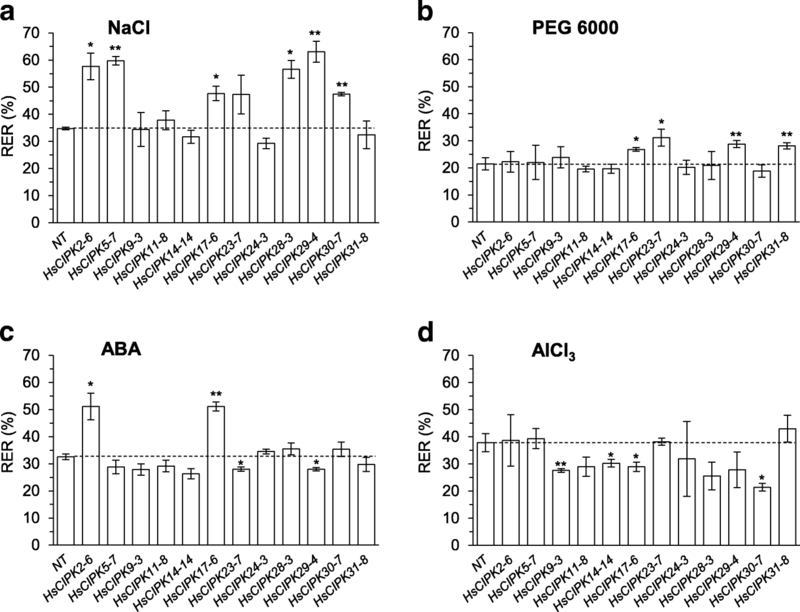 6a-c, upon transgenic seedling exposure to NaCl, PEG6000, and ABA treatments, respectively, the overexpression lines for six HsCIPKs (HsCIPK2, 5, 17, 28, 29, and 30) in the NaCl treatment, four HsCIPKs (HsCIPK17, 23, 29, and 31) in PEG 6000 treatment, and two HsCIPKs (HsCIPK2 and 17) in the ABA treatment displayed a significantly enhanced effect on root growth relative to the corresponding NT, indicating a positive role of these HsCIPKs in plant tolerance to salt and drought stresses and ABA treatment. However, in the AlCl3 treatment, no transgenic lines showed an enhanced effect on root growth relative to the NT (Fig. 6d). In contrast, the transgenic lines overexpressing two HsCIPKs (HsCIPK23 and 29) in the ABA treatment (Fig. 6c) and four HsCIPKs (HsCIPK9, 14, 17, and 30) in the AlCl3 treatment (Fig. 6d) exhibited an inhibitory effect on root growth relative to the corresponding NT, indicating a negative role of these HsCIPKs in the plant response to ABA and AlCl3 stresses. The responses of root growth to these abiotic stresses in the transgenic lines of all 12 HsCIPKs are summarized in Additional file 1: Table S7. These results further confirmed the roles of HsCIPKs in the plant response to salt and drought stresses. Previous studies have demonstrated that plant-specific CIPKs function in plant responses to various abiotic and biotic stresses, including salt, drought, low and high temperature, wounding, low oxygen, and pathogen infection (Shen et al. 2014; Yu et al. 2014). However, the evidence for whether CIPKs are involved in the plant esponse to heavy metal toxicities currently remains lacking. In this study, we used an in silico assay and a molecular cloning strategy to isolate 12 HsCIPKs from Tibetan Plateau annual wild barley and subsequently examined the heavy metal toxicity-induced expression patterns of 12 endogenous HsCIPK genes and determined the role of their overexpression in the rice response to multiple heavy metal toxicities and other abiotic stresses. Our time-course qRT-PCR analysis (Figs. 2, 3 and 4; Additional file 1: Tables S5 and S6) revealed that all of the 12 endogenous HsCIPKs examined can be induced by multiple heavy metal toxicities, including Hg, Cd, Cr, Pb, and Cu, and in addition, nine HsCIPKs (except for HsCIPK11, 14, and 23) are also induced by multiple other abiotic stresses, including salt, drought, cold, heat, and Al stresses, and ABA treatment. Heavy metal treatment experiments (Figs. 2 and 3; Additional file 1: Table S5) showed that HsCIPK17 and 29 can be highly induced by all five heavy metal toxicities examined, whereas HsCIPK2, 11, 14, 23, 24, and 30 are highly induced by four heavy metal toxicities. In addition, HsCIPK9 and 31 are also highly induced by three heavy metal toxicities. In addition to the response to heavy metal toxicities, HsCIPKs also respond to other abiotic stresses, including salt, drought, temperature, and Al stresses. Of note, the transcriptional induction levels corresponding to these stresses (Fig. 4; Additional file 1: Table S6) are relatively low compared to those corresponding to heavy metals (Figs. 2 and 3; Additional file 1: Table S5). These data suggest that multiple HsCIPKs are involved in the plant response to heavy metal toxicities and other abiotic stresses. Previous studies have shown that wheat TaCIPK14 and Arabidopsis AtCIPK14 are upregulated by treatments with salt, PEG, and ABA (Deng et al. 2013; Yan et al. 2014). In contrast, our treatment experiments (Additional file 1: Tables S5 and S6; Figs. 2 and 3) revealed that HsCIPK14 is downregulated by salt, PEG, heat, and ABA treatments but upregulated by multiple heavy metal toxicities, including Hg, Cd, Cr, and Pb. Similarly, Brachypodium distachyon BdCIPK31 was found to be downregulated by salt, PEG, H2O2, and ABA treatments (Luo et al. 2017), whereas HsCIPK31 is upregulated by not only salt, PEG, ABA, Al, and cold treatments but also multiple heavy metal toxicities, including Hg, Cd, and Cu (Figs. 2, 3 and 4; Additional file 1: Tables S5 and S6). These different responses clearly reflect the functional divergence of the CIPK paralog genes in distinct plant species in response to various abiotic stresses during long-term evolution. The overexpression experiment in rice (Figs. 5 and 6; Additional file 1: Table S7) showed that the individual overexpression of 11 HsCIPKs (except for HsCIPK28) promotes root growth tolerance to multiple heavy metal toxicities (Hg, Cd, Cr, and Cu), and furthermore, plants individually overexpressing 8 HsCIPKs (except for HsCIPK9, 11, 14, and 24) display enhanced tolerance of root growth to salt, drought, and ABA treatments, further confirming the involvement of the HsCIPKs in the plant response to heavy metal toxicities and other abiotic stresses, including salt and drought. However, we cannot rule out the possibility that the transgenic lines of some HsCIPKs with no positive role in root growth tolerance to most of stress treatments are due to their inadequate expression levels, for example, HsCIPK11 and HsCIPK23 (Additional file 1: Figure S5). In addition, PbCl2 and AlCl3 treatments in wild barley significantly induce the transcriptional expression of multiple HsCIPKs (9, 14, 17, 24, 28, 29, 30, and 31; Fig. 3; Additional file 1: Tables S5 and S6), but the overexpression of HsCIPKs (9, 14, 17, 28, 29, and 30) in rice inhibits the root growth tolerance to Pb and Al toxicities (Figs. 5 and 6; Additional file 1: Table S7). Similarly, the overexpression of HsCIPK31 in rice inhibits the root growth tolerance to Cr toxicity, which does not visibly induce HsCIPK31 transcriptional expression (Fig. 5; Additional file 1: Tables S6 and S7). Although Al and heavy metal toxicities affect plant root growth differentially, our results clearly indicate that these HsCIPKs act as a negative regulator in the plant tolerance to Pb, Al, and Cr toxicities. This finding is similar to the previous studies showing that ABA treatment induces endogenous BnCIPK6 and AtCIPK6 expression transcriptionally, although their overexpression in Arabidopsis enhances the sensitivity to the ABA treatment (Chen et al. 2012; Chen et al. 2013), and that the loss of AtCIPK5 function mutants display an increased resistance response to pathogens (Meteignier et al. 2017), and therefore Bn/AtCIPK6 and AtCIPK5 are a negative regulator for plant tolerance to ABA treatment and pathogen attack, respectively. It is likely that during the plant response to Pb, Al, and Cr toxicities, these HsCIPKs with a negative role may exert feedback regulation on the positive functions of other HsCIPKs/CBLs and/or other calcium sensors (CaMs, CMLs, and CDPKs). This hypothesis will require additional study. Fortunately, a high-quality reference genome assembly for cultivated barley has been recently published (Mascher et al. 2017) and thereby will accelerate the functional identification of all HsCIPK family members. It is widely acknowledged that multiple CIPKs in distinct plant species redundantly function in salt, drought, and ABA stress responses (Luan 2009; Weinl and Kudla 2009; Shen et al. 2014; Yu et al. 2014). Consistently, our findings (Figs. 5 and 6; Additional file 1: Table S7) reveal that the same single HsCIPK is involved in the response to multiple distinct heavy metal toxicities, whereas multiple HsCIPKs function in the response to the same single heavy metal toxicity, indicating that plant-specific CIPKs are functionally redundant in the regulation of the plant response to heavy metal toxicities. The identification of knockout or knockdown mutants for HsCIPKs will provide genetic evidence for HsCIPK function in heavy metal toxicities. The traditional remediation strategies for heavy metals-contaminated soils primarily depend on physical and chemical methods and are expensive and relatively ineffective due to large-scale contamination farmlands and high costs. Thus, the best approaches are to genetically engineer crops with high resistance to heavy metal toxicities (Cao et al. 2014). Rice, as a primary food cereal in the world, is one of the major sources of heavy metal intakes for humans in inland China (Zhang et al. 2010), and therefore, developing rice cultivars with a higher tolerance to multiple heavy metal toxicities is critical for heavy metal-polluted soils that usually contain multiple heavy metal toxicities. Intriguingly, our results (Figs. 5 and 6; Additional file 1: Table S7) showed that the overexpression of the same single HsCIPK enhances rice growth tolerance to multiple heavy metal toxicities, indicating that these identified HsCIPKs (2, 5, 9, 14, 17, 24, and 29) are important for genetically engineering crops with multiple heavy metal tolerances, which will have a broad application in heavy metal-contaminated soils. However, the mode of action by which HsCIPKs enhance plant tolerance to heavy metal toxicities via modulating heavy metal excretion and/or chelation mechanisms or scavenging heavy metal-induced ROS remain to be experimentally elucidated in future studies. Using an in silico assay and a molecular cloning strategy to isolate 12 HsCIPKs in Tibetan Plateau annual wild barley enabled us to the effects of heavy metal toxicities on the transcriptional expression patterns of 12 endogenous HsCIPK genes and evaluate their functional roles in the response to multiple heavy metal toxicities and other abiotic stresses in rice. Multiple HsCIPKs were found to be involved in the response of plants to heavy metal toxicities, including Hg, Cd, Cr, Pb, and Cu and other abiotic stresses, including salt, drought, Al, low and high temperature, and ABA. 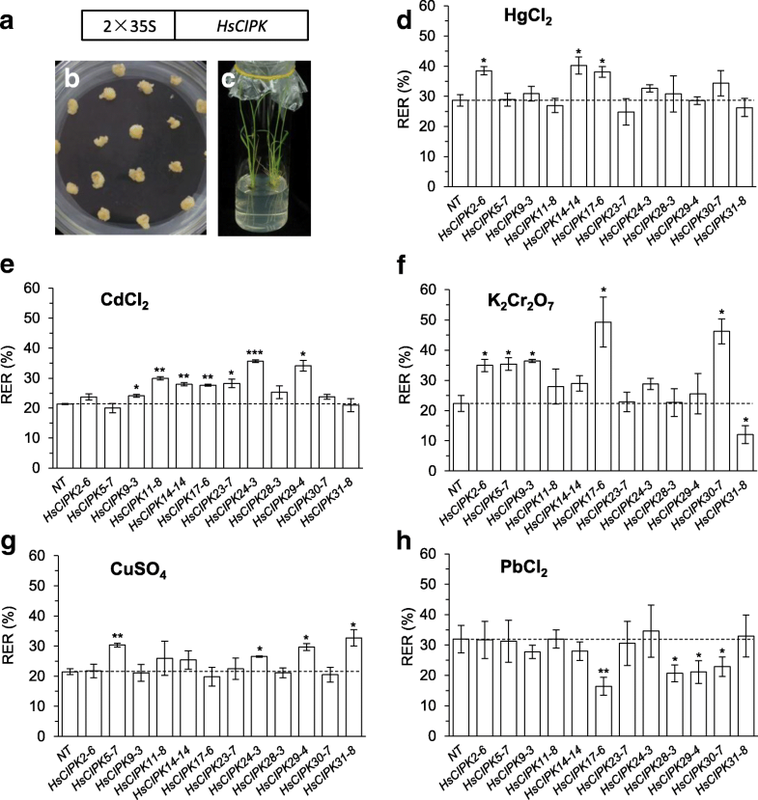 The ectopic overexpression of HsCIPK2, 5, 9, 14, 17, 24, and 29 in Nipponbare rice (Oryza sativa) enhanced the tolerance of rice root growth to multiple heavy metal toxicities, whereas the overexpression of HsCIPK2, 5, 17, 23, 24, 28, 29, 30, and 31 promoted root growth tolerance to salt and/or drought stresses. 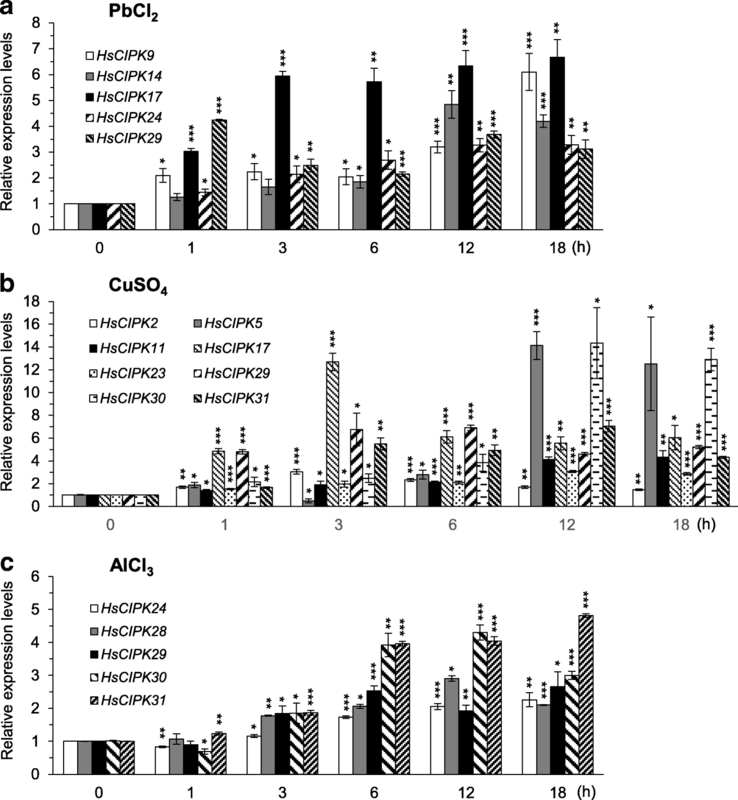 These results suggest that plant-specific CIPKs function in heavy metal toxicities and these HsCIPKs examined will have a broad application in genetically engineered rice and other crops with tolerance to heavy metal toxicities and other abiotic stresses. Weihuai Pan, Jinqiu Shen and Zhongzhong Zheng contributed equally to this work. We thank Guoping Zhang (Zhejiang University), Yinong Yang (Pennsylvania State University), and Lin Yang (Zhejiang Normal University) for sharing materials. This study was supported by the National Science and Technology Major Program for New Varieties of Genetically Modified Crops (2009ZX08009076–003), the National Natural Science Foundation of China (No. 31670283 and 91754104), the Natural Science Foundation of Zhejiang Province (No. LY16C130004 and LY17C060001), and the Fundamental Research Funds for the Central Universities (lzujbky-2017-ot16). All data supporting the conclusions of this article are provided within the article (and its additional files). WP, JS, ZZ, LJ, and JP conceived the study and designed the experiments. WP, JS, ZZ, XY, JS, and WW carried out the bioinformatic assays and the experiments. WP, JS, ZZ, LJ, and JP analyzed the data. WP and JP wrote the manuscript. WP, LJ, and JP revised the manuscript. All authors read and approved the final manuscript. These coauthors involved in the paper all consent to publish this article on Rice.